When you put on a new roof, you expect it to last at least 20-years. Having the right contractor for the job is critical in getting your money’s worth. A properly installed roof takes time and is not cheap — it’s truly an investment in your home. But if a contractor cuts corners either due to inexperience or to give you the cheapest price just to get the job, a new roof could fail. Here are some things to consider if you have recently put on a new roof and are experiencing problems. Poor installation. 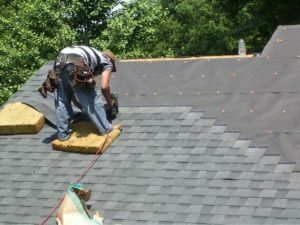 Even if a contractor installs the best shingle available, if it’s not installed correctly, the roof can fail. Using a contractor who is experienced in installing a particular manufacturer’s product is important because they have experience with the products and know how things like the manufacturer’s roof deck protection, leak barriers, and ventilation all work together to help protect your home. Inadequate ventilation. A properly balanced attic ventilation system* helps to keep your roof healthy. A combination of intake, which allows cool, fresh air to enter the attic and exhaust, which pushes hot, moist air out, is needed. During the hot summer months, improper ventilation can contribute to damaging heat and moisture build up in the attic. In the winter, improper ventilation can be a factor in the formation of ice dams. Make sure your contractor addresses ventilation in your home and inspects the attic space. Skimping on materials. Don’t just choose the cheapest bid, as that can come at a price if a contractor skimps on items such as edge metal, sealants, or leak barriers. Ask contractors what materials they use. If a contractor is skimping on important items like sealants and leak barriers, paying a bit more upfront may be worth it. Cutting corners on flashing. Some contractors think chimney flashings are installed more for design than function, so they may cut corners and just use caulk to seal. Caulk can break down over time and can cause water to enter the home through the flashing. Step flashing combined with counter flashing is a good way for your contractor to waterproof a chimney, skylight, or wall. It takes more labor to do the job right, so you need to understand that cutting corners just puts your home at risk — and could cost more in the long run. If you have questions about your roof, feel free to contact us! We are happy to help, even if we did not install it.